(MOSCOW) Shocking increases in accusations of wrongdoing by Transportation Security Administration officers has drawn strong condemnation from ranking congressional members of Homeland Security, as well as a snippy “Told’ja so!” from fugitive former U.S. spy agency contractor Edward Snowden. “See? That’s why I didn’t seek refuge at Dallas/Fort Worth International or, say, Eppley Airfield near Omaha. The TSA couldn’t be trusted not to steal the secrets that I’d worked so hard to steal,” Snowden told reporters. According to a Government Accountability Office report, complaints against TSA officers rose 27 percent from 2010 to 2012. While only 56 of the more than 9,000 allegations in that period dealt with theft, nearly a third were for unexcused absences or repeated tardiness. “There’s just no place for that sort of rudeness,” complained Snowden who, after spending more than five weeks in Moscow’s Sheremetyevo airport, was granted a year’s asylum by Russia. Russian TSA counterparts remind traveler to extinguish all smoking materials for his own safety. 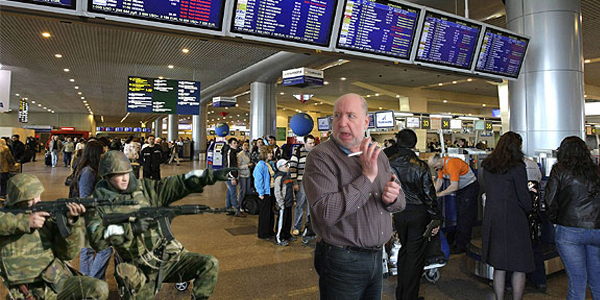 “Russia’s TSA counterparts here couldn’t have been nicer. They kept me supplied with moist towelettes, were always buying me drinks, and constantly offered to store the heavy leather valise I keep chained to my wrist,” Snowden told reporters before slipping quietly away from the airport inside the turret of a Russian T-90 battle tank.